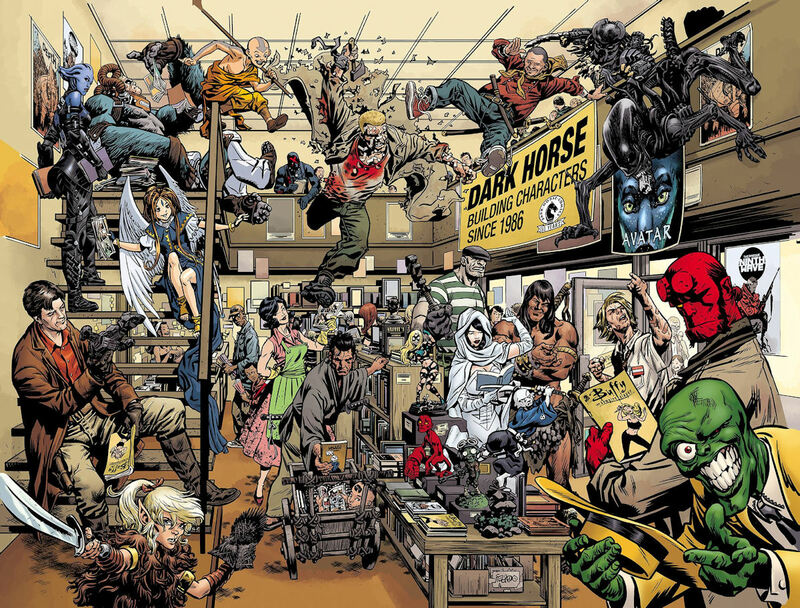 Founded by comic shop owner Mike Richardson in 1986 with the publication of the anthology series Dark Horse Presents, Dark Horse Comics has gone on to become one of the biggest of all the independent publishers. They've both adapted several movies and tv series - Aliens, Predator, Terminator, Incredibles, Star Wars, Serenity, Lone Gunmen, Star Wars, Xena and Buffy among others - into successful comics, and had a number of their comics turned into movies - notably Timecop, 300, Sin City and the Mask. As well as those below, and some listed in the universes sections above, Dark Horse have long published Aliens and Predators comics. I'm not covering them since they don't fit the parameters of this site. Dark Horse have also done some very nice collections of titles from other, usually defunct, companies, such as the Creepy Archives and Eerie Archives (both Warren), Doctor Solar, Magnus Robot Fighter, Turok (all Gold Key), Flash Gordon (newspaper strips), Herbie, Magicman, Nemesis (all ACG), and Green Lama.